Every story begins in mystery. When we first sit down to read, the characters are strangers to us; events are yet to unfold. The weight of the unread pages rests comfortably in our hand: a promise of things to come. Few stories end with as many mysteries as they begin with, and fewer still with more. Ladivine is one of those rare books that dispenses with explanations in favour of a magical realism which is enchanting despite, or because of, its ambiguity. Malinka Sylla and her mother mean nothing to anyone, but Ladivine Sylla does her best to make amends for this by treating her daughter like a princess. The mother of a princess should be a queen, but Ladivine Sylla is only a poor housekeeper; a poor, black housekeeper of whom Malinka is ashamed. With her naturally lighter skin and chestnut hair, supposedly inherited from her absent father, Malinka creates a new identity for herself – one that does not include her mother. Borrowing her Christian name from an old classmate and her surname from her husband, Malinka Sylla becomes Clarisse Riviére – and Clarisse Riviére’s mother is dead. The issue of race is central to Ladivine, yet it is so subtly handled that at first it barely shows. When Malinka attends school “nothing distinguished her from the children she joined in the playground” and her mother “didn’t look as if she should be her mother”. When a fellow pupil asks with disgust who that woman might be, Malinka replies “my servant” to avoid that disgust being directed also at her. A few pages later, when Malinka is a teenager, she heightens “the natural pallor of her face with wan makeup”. The beauty of these hints is that they are understated, but at the same time straightforward, and grounded. The fact that we understand why Malinka is ashamed of her mother without it being spelled out to us shows our own lack of innocence, our intimate knowledge of the prejudice that exists in the world and our part in it. Malinka’s shame is our shame. It is this shame and guilt which ultimately destroys the new life that Clarisse Riviére has built for herself, because Clarisse Riviére is not real. She is an invention, a simulacrum of a woman created to be the outward appearance of Malinka Sylla, to hide that true identity from the world. Like the telltale beating heart, she hides her shame and her mother away, but cannot forget them. Clarisse Riviére remains distant to her friends and loved ones to hide her guilty secret, but her husband Richard senses that there is something that keeps him from knowing the real Clarisse and yearns to see her true face. The secret destroys their marriage and, as the story shifts from realism to mysticism, the legacy of shame and guilt will be passed to her daughter, Ladivine Riviére, who bears her unknown grandmother’s name like a curse. 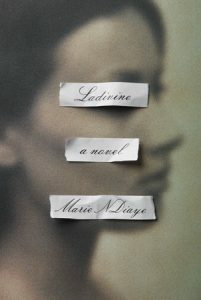 Malinka’s rejection of her mother infects all those close to her, despite their own innocence, and, through this, Marie Ndiaye shows us that prejudice does not just harm the victim, it wounds us all. Traumatic events, she shows us, can grow from the smallest seed – like the disgust on a little girl’s face when she asks who that woman might be. Readers may sometimes find themselves frustrated by Ladivine. We are used to a traditional plot structure in which our questions are answered, and, by the end, the issues of the plot have been resolved. Ladivine makes us search for our answers, and even then, our search often yields few results. Those looking for leisure reading should seek it elsewhere, but for those willing to spend the time and energy, Ladivine will reward them with moments of deep poignancy and incisive observation.